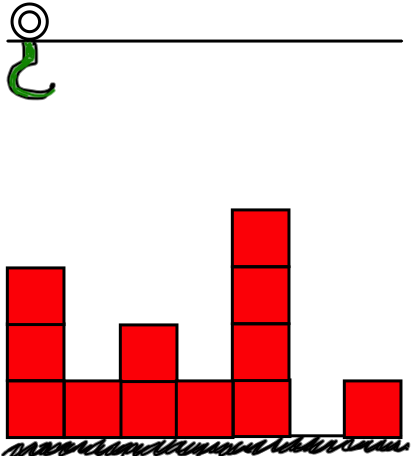 You are playing a video game in which several stacks of boxes are lined up on the floor, with a crane on top to rearrange the boxes, as shown in the picture below. Further, there is a limit H on the number of boxes on each stack. If a 'drop' command would result in a stack having more than H boxes, the crane ignores this drop command. If the current stack has no boxes, a 'pick up' command is ignored. You are given the initial number of boxes in each stack and the sequence of operations performed by the crane. You have to compute the final number of boxes in each stack. the number of boxes in each stack from left to right would be 2,1,3,1,4,0,1. • Line 1 : The width of the game (the number of stacks of boxes), N, followed by the max height H of each stack. • Line 2 : N integers, the initial number of boxes in each stack, from left to right. Each number is ≤ H.
• Line 3 : A sequence of integers, each encoding a command to the crane. • The command Quit (0) appears exactly once, and is the last command. • The initial position of the crane is above the leftmost stack, with the crane not holding any box. A single line with N integers, the number of boxes in each stack, from left to right. • The number of commands is between 1 and 105, inclusive. • 1 ≤ H ≤ 108. There are 18 test inputs on the server during the exam.